We're super excited to be holding this year's holiday fest at GNR and long-time LTH favorite, Aroy Thai. T, Mama and the entire crew are excited to be hosting us. They're going to create a special meal for us that will combine many of their greatest hits, along with a few special items they're eager for us to try. The meal will be served partially as a buffet and partially family-style. Ticket sales are now live and the cost is $45 per person (includes dinner, tax and tip). Beverages will be on your own tab and happily, this is also a byob event. The buffet will not be vegetarian-friendly but a vegetarian option will be available to anyone who requests it in advance, and you can do that here on this thread. More details about the meal and the event can be found on the sign-up page. Once you pay in-full for your tix, we'll add your name(s) to the list of confirmed attendees. Capacity is limited to 44 people. Because of the limited space, we're also limiting sales to 2 tickets per LTH member. As much as we love meeting new people, especially at holiday time, this event is not the best place for that. It's also important to note that much of this meal will be spicy. Other than a few dishes that are not inherently spicy, the rest of the meal will likely rate at 4 on a 1-5 scale. The Gift Exchange has been a part of our yearly celebrations since we held our first such event at Klas. If you want, please bring a food-related raffle item. For the raffle/gift exchange, all gifts go into a pool and names are drawn. If you do bring a gift, you get a ticket and are guaranteed one gift in exchange. We’ve set the price for each gift at around $15. Please don’t wrap the gift — we like to see what people are winning before they win it — but please do put your name (real name or screen name or both) on the gift so that lucky recipients know who to thank. Mamagotcha has graciously agreed to collect items for the Greater Chicago Food Depository. She’ll post a list here of the items that are most needed this time of year. Just bring them to the party and we’ll make sure they get to people who need them. Any questions? If so, please feel free to post them here. Just a note that we're not trying to be coy or evasive about the menu details. It's just that there are a lot of favorites to choose from, too many to include them all. So, T and Mama are going to think it over, giving careful consideration to creating a representative, well-rounded menu that will perform well given our particular parameters. You can pretty much count on Thai wings, grilled pork neck salad, som tum Thai, tom yum beef ball and tender, northern larb fried rice, a combination of sausages -- hopefully, to include a special one that's not on the menu -- and several more dishes that have been widely praised here. As the picture becomes clearer, we'll continue to post specifics. In the meantime, here are a few pics from a very recent meal at Aroy . . . I Accept and understand that Thai food is spicy. of any options that allow for adding additional spice to one's taste. irisarbor wrote: I Accept and understand that Thai food is spicy. I am in this club, too. Cleanse your digestive tract with FIRE!!! JoelF wrote: Moderation is for monks. Moderation and the monastic life are not two things I would think of as going together. Moderation is for wimps, now, I can see that statement being made. But then I guess I'd be among the wimps, along with Cathy2 and irisarbor. I wouldn’t dwell so much on spice levels, if I were you. It’s true that Mama is going to make the spicy dishes at an appropriate spice level, neither over the top spicy or dumbed down for the spice averse, but there are also going to be plenty of dishes that are not spicy at all. For example, of the dishes already mentioned in this post or the ticket purchases page, chicken wings, pork neck salad, the various sausages, cucumber salad, and tom yum beef ball soup are not spicy at all. If you encounter a dish that is too spicy for you, or one you don’t like, simply skip it (Personally, I loathe the bamboo curry dish at Aroy that so many LTHers love so much. My plan is to not eat any of that, should it turn up on the menu. No big deal). I can guarantee that there will be plenty to eat and you won’t go away hungry. stevez wrote: I wouldn’t dwell so much on spice levels, if I were you. It’s true that Mama is going to make the spicy dishes at an appropriate spice level, neither over the top spicy or dumbed down for the spice averse, but there are also going to be plenty of dishes that are not spicy at all. For example, of the dishes already mentioned in this post or the ticket purchases page, chicken wings, pork neck salad, the various sausages, cucumber salad, and tom yum beef ball soup are not spicy at all. If you encounter a dish that is too spicy for you, or one you don’t like, simply skip it (Personally, I loathe the bamboo curry dish at Aroy that so many LTHers love so much. My plan is to not eat any of that, should it turn up on the menu. No big deal). I can guarantee that there will be plenty to eat and you won’t go away hungry. Well said, Steve. 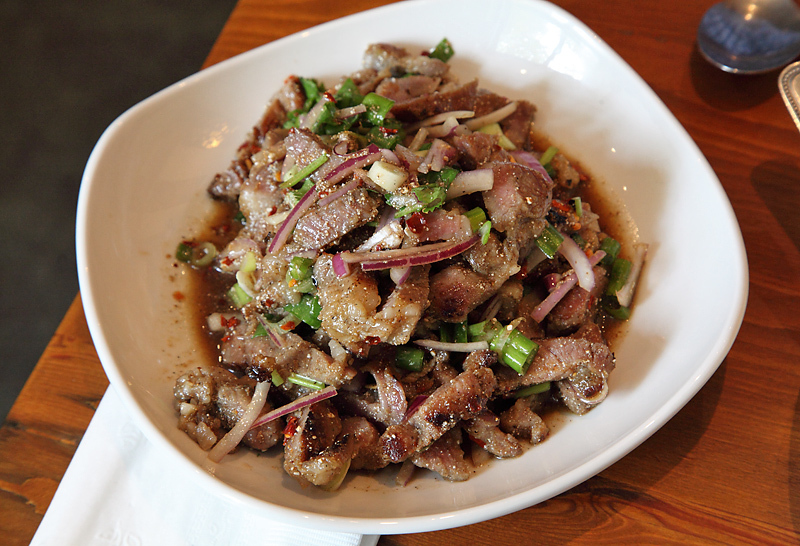 The only thing I might offer caution on is the Grilled Pork Neck Salad, as that could be a spicy one. But as you correctly pointed out, there will be plenty to eat for everyone there, even if some dishes are too spicy, too funky or too whatever for some of us. Let's please not turn this into an unnecessary 'debate' about the merits, or lack thereof, about eating spicy Thai food. And really, if you're not planning to attend the party (or considering attending), is there any reason at all to be posting on this thread? Perhaps because I have a PayPal account, it didn't offer me the option of leaving a message -- but I use my real name on LTH, so I'm hoping PayPal makes it obvious where the money is coming from. Looking forward to celebrating another holiday with my LTH friends. Cynthia wrote: Perhaps because I have a PayPal account, it didn't offer me the option of leaving a message -- but I use my real name on LTH, so I'm hoping PayPal makes it obvious where the money is coming from. Looking forward to celebrating another holiday with my LTH friends. Yep, you're all set and I've added you to the list. Looking forward to seeing you! Is BYOB the only form of alcohol available or is it simply an option? lougord99 wrote: Is BYOB the only form of alcohol available or is it simply an option? It's the only option for alcohol. I'm pretty sure Aroy serves soft drinks, though. With over 3 weeks to go, we're just about 2/3 full and history suggests that we're moving toward a sold-out event. I just want to remind everyone once again, especially those who are heat-averse, not to be overly concerned. 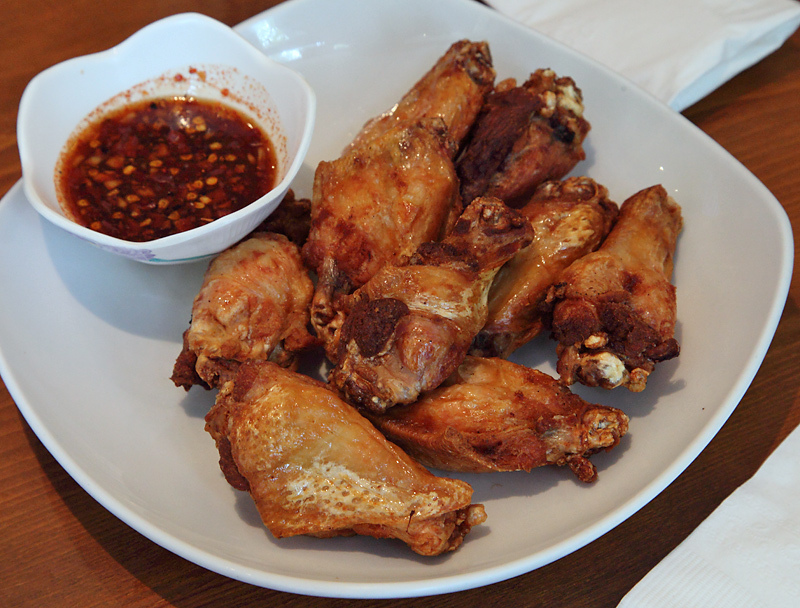 We expect there to be plenty of dishes on the menu that are not innately spicy. And, we have no plans to arbitrarily amp up the heat on those dishes solely for the sake of doing so. But by the same token, dishes that are typically served spicy, will be served as such at this dinner. As I initially posted, 4/5 on the heat level is what you can expect on those select dishes. Right off the top of my head, I can think of several savory dishes that are likely to be on the menu that are not innately spicy. And I know, for example, that dessert will not be spicy. So, some dishes will be spicy but there will certainly be plenty for everyone to eat. Just like at any communal meal, one can expect that not every single dish will be to every single attendee's liking. Looking forward to it! Just sent my money for me and Mr. X. I forgot to note that though. The GP wrote: Looking forward to it! Just sent my money for me and Mr. X. I forgot to note that though. I have to say that I'm particularly excited about the byo aspect this year. Nothing pairs better with Thai food than sour beer and I've got a few large-format bottles set aside that I'm really looking forward to sharing. 22 days to go! I'm more of a wino. What type of wine should I look for? Pie Lady wrote: I'm more of a wino. What type of wine should I look for? Often recommended with Thai foods are Riesling and Gewürztraminer. Once upon a time, there was an active poster with the Thai ex-wife who always recommended those wines. He also conducted a chicken-taco sampling to determine the best taqueria, but that was not as successful an idea. A well-balanced Riesling (not overly dry but not cloyingly sweet, either) would work. I think a similarly balanced sparkler would also be a good choice. Chablis, Chenin Blanc might also work but I think you'd have make a more specific choice there. You'll need some sweetness to complement the spice but something completely devoid of acidity probably won't be a great fit. As in past years, all your donations will benefit the Greater Chicago Food Depository, the main food bank in our area. Every single dollar you donate will provide three meals to a hungry Chicagoan. The GCFD has special targeted programs to benefit families, children, seniors, and veterans... our most vulnerable citizens. It is truly a privilege and one of my very favorite personal holiday traditions to deliver your generous donations each year the morning following our party! If possible, please avoid items packed in glass. We will have some boxes available to collect your kind donations at the party. If you prefer to donate a check or cash, you can give them directly to me at the party (checks should be made out to the Greater Chicago Food Depository). Thank you all for your kind support of our annual food drive! Good morning everyone. Only 8 spots remain. If you're on the fence about this one, I think now's the time . . .
from Alsace, it's a little more pricey, but it is SO good. so the A is the driest and K is the sweetest. but hey, that's me, and you might like a different one. Yep, got it. 2 spots are now left.